John Hartson played as a striker for Luton Town, Arsenal, West Ham, Wimbledon, Coventry City, Celtic and West Bromwich Albion. He was also capped 51 times for Wales. Having retired from the game in 2008, John has become a high-profile football pundit. Shortlisted for Autobiography of the Year at the British Sports Book Awards. In July 2009, former Celtic and Wales soccer star John Hartson was diagnosed with testicular cancer, which had also spread to his lungs and brain. But before his treatment even began, John came to the brink of death after contracting pneumonia, ceasing to breathe and undergoing emergency brain surgery. Against all the odds, he pulled through, and in Please Don't Go he documents his incredible fight for life. Profoundly moving, John's own story is interwoven with the poignant recollections of his pregnant wife, Sarah, as well as with extracts from his sister Victoria's personal diary. This remarkable book covers the five-week period during which John's survival was most in jeopardy. John's truly inspirational account of how he has managed to overcome a very aggressive form of cancer will offer hope and courage to others affected by the disease. 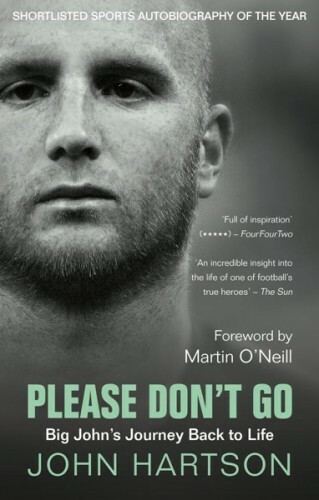 It is a touching and ultimately uplifting insight into the bravery of the popular football hero, who has fought back to full health in the face of adversity.